In what has to be the most egregious disconnect between target audience and product since that series of Saw-branded children’s books, Sega has decided that the next logical step for their beloved Sonic franchise (stop laughing) is to move into the world of entertainercizing. Wait, no, exercitainment. Look, they’re gonna make you run. 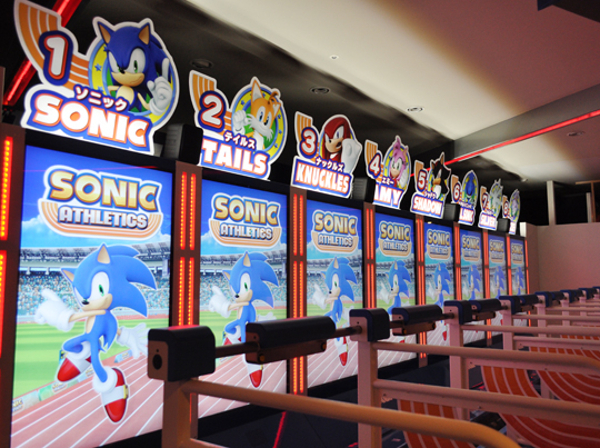 That’s right, much like Olivia Newton-John, Sega will be encouraging gamers to “get physical” with their new title, Sonic Athletics, currently premiering at their Joypolis location in Tokyo. While it may sound like some kind of stripper portmanteau, Joypolis is actually a brand of arcade amusement parks located throughout Japan, equipped with a variety of physical-interaction games. 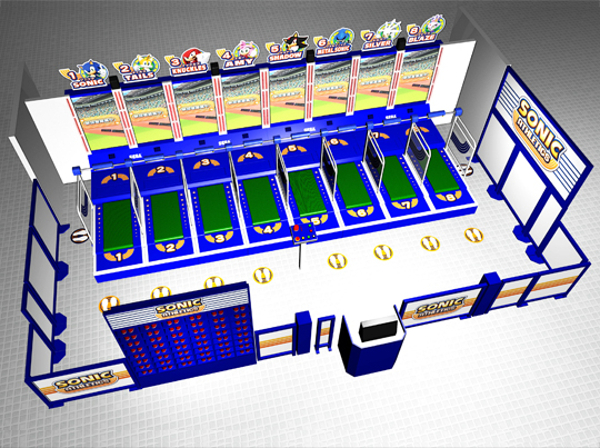 Per an article at Siliconera, Sonic Athletics will consist of an eight-treadmill setup that’ll have players competing in 100 meter dash, long jump and 110 meter hurdle competitions. Feel free to confirm that at the official site (hope your Japanese is better than mine). Looking at the setup, it seems players will grip a handlebar in front of them, and then move their feet to get the treadmill going, which suggests less of a sprint and more of a slog to jog type affair, but that’s just speculation. Being American I have no idea how far 100 meters is, but I’m assuming about twice as far as I’m personally interested in running. That being said, I have been known to routinely humiliate myself via public DDR exhibitions, so who can say. Given the odds of someone faceplanting on this thing hover somewhere around 99.9% I wouldn’t expect it to be transplanted to the US immediately, but if you feel strongly about sweating in public, feel free to petition your local Dave & Buster’s. As for those looking for a more civilized simulated exercise experience, might I suggest equestrianism?